Our restless efforts to promote multicultural education include to better serve the growing student body of color in the U.S (Banks, 2006). But it seems that hiring teachers of color is not so easy. According to the article “Tough Tests for Teachers, with Question of Bias” in NY Times regarding new teacher licensing exams, “Minority candidates have been doing especially poorly, jeopardizing a long-held goal of diversifying the teaching force so it more closely resembles the makeup of the country’s student body.” It brings our attention to whether the test itself is discriminatory. The Brown v. Board of Education case demonstrates our historical mistakes about segregating schools. After the decision which mandated non-discrimination in schools, certification exams were used as “a tool kit used to force black teachers out of the profession.” Are we repeating the same mistakes we made before? Why is it important to have a teacher of the same race? Teachers are not just teachers who transfer their knowledge to students. They are mentors and role models. Sharing similar cultural beliefs, values, and norms would be a great tool for teachers to build such relationships with students. Accordingly, hiring racially and ethnically diverse teachers will ensure minority groups of students to have equal educational opportunities. As Linda Darling-Hammond, a professor of education at Stanford, argued, “We need to be clear about what skills are necessary, rather than just trying to eliminate people from the pool.” From this perspective, teacher licensure tests alone cannot be a major qualification of teachers. Although it might be true to an extent that “rigorous entrance requirements” for teachers are crucial to ensure a good quality of education, it does not mean that so called smart teachers better teach students. Having an appropriate level of knowledge in a subject is important, but the way of teaching is as critical in meeting students’ needs. It is a time for policy makers to carefully examine what is truly beneficial for students of all backgrounds. Banks, J. (2006). Multicultural education: Characteristics and goals. When Diane Ravitch came to Lehigh University on February 10, 2015, I wasn’t sure what to expect. Having read her book, The Death and life of the great American school system, the week prior to her arrival, I was sure that she would touch upon three hot topics: charter schools, the voucher system, and No Child Left Behind (NCLB). Her writing style was both understandable and captivating, and I was sure that her in-person speech would be no different. However, the level of passion and ferocity with which she delivered her speech nothing short of shocked me. Diane Ravitch blended humor and gusto with her scholarly work and decades of experience, and I would describe her as nothing short of revolutionary. Ravitch excited and enthused the crowd, providing not only statistics and research regarding the current state of American education, but also suggestions for positive change. The point that struck me most in Ravitch’s entire “debate” (which was essentially a solo performance, as her opposition did not attend) was her claim that poverty is the cause of poor education. She informed the audience that the United States has one of the highest, if not the very highest, level of child poverty of any developed country. The US education system, in turn, is failing these impoverished children because options such as charter schools are luring away the most motivated students and most creative teachers away from public schools. Though impoverished families are technically given equal opportunity to send their children to specialized or nontraditional schools, they frequently must provide transportation to this, say, charter school which is likely to be further from their homes. Ravitch cites this segregation – the encouragement of creative, motivated students from financially stable families to attend schools other than their local public school – as the partner to poverty in destroying the public school system. While the intentions of charter schools are noble and aim to provide healthy competition, they essentially leave behind the less motivated and less fortunate students in this supposed era of No Child Left Behind. Because I am extremely passionate about Latin America, I tried to put some of Ravitch’s debate points into a Latin American context. First, I extended her claim that poverty causes poor education in the afflicted individuals to a national context. 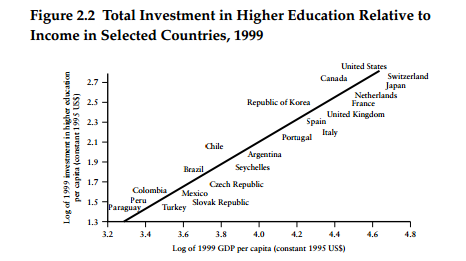 A Figure below from a World Bank statement on Latin America’s situation relative to the rest of the globe expresses how countries’ GDP relates to the investment in higher education; these two variables are shown to have an obvious positive correlation. Every single Latin American country included in the Figure (Paraguay, Peru, Colombia, Brazil, Chile, Mexico and Argentina) was not only at the bottom half countries in regards to GDP, but also in regards to money spent on higher education. These seven countries constitute 90% of Latin America’s population as a whole and therefore these statistics are representative of the entire region (The World Banks, 2005, p. 341). Paraguay, Peru, and Colombia have the lowest GDP and lowest investment in higher education of all the countries studied. This expands Ravitch’s point that impoverished people and impoverished countries are at a disadvantage when it comes to education. Because these Latin American countries have limited financial capital to invest in higher education, a large portion of their populations will not have the opportunity of pursuing a degree in higher education, thus perpetuating the cycle of poverty and undereducated youth. As I mentioned, Ravitch closed her “debate” with suggestions for positive change in the American school system, from which Latin America would certainly also benefit. Two of these suggestions very directly address the recurring issue of poverty inherent in the school system. Interestingly, her very first suggestion to improve public education was to provide and improve upon prenatal care because poor women do not receive it, which leads to increased likelihood of disabilities among their children, giving them an additional disadvantage to their already impoverished background. Another suggestion she offered was broader and entailed reducing the toxic combination of segregation and poverty. She offers plenty of other suggestions such as reducing class size, promoting a well-rounded curriculum, increasing teacher standards, and decreasing standardized testing, but the most relevant suggestions for the Latin American context, according to the World Bank data, were those involving the provision of resources for impoverished families, as those would benefit a large portion of those countries’ populations. The applicability and pertinence of Diane Ravitch’s entire lecture, and her entire book for that matter, shows its relevance not only in an American context, but in a global context. As curriculum and education practices are being borrowed and lent from country to country, these problems will also prove to be transferrable, as well as the solutions Ravitch proposed. I think it would be opportune for educators in foreign countries, especially those trying to emulate the American or Western school system, to be aware of the points Ravitch makes in order to prepare for the effects of its implementation. The World Bank. (2005). The Latin American Way: Trends, Issues, and Directions. In Higher education in Latin America: The international dimension (chapter 11). I obtained my Bachelor’s degree in Adolescent Education and Social Studies from St. John’s University in Queens, New York in May 2011 and was excited to find a full-time teaching position for the upcoming school year. After endless interviews, I received the phone call I had been waiting patiently to hear. I was offered a full-time teaching position for a public high school in Brooklyn, New York. I was full of excitement and enthusiasm as well as nervousness at the realization that I was about to be in charge of my own classroom and hundreds of adolescents. I was ready to take on the challenges that would ensue as I tried to make a difference in children’s lives and prepare them for their futures. I had always felt that some sacrifice on behalf of the teacher was necessary to ensure student success; however, I was completely unprepared for the realities of being a full-time teacher and the extent of sacrifices I would have to make for students, particularly in an inner-city school. After the first few days of school, I was in complete shock and baffled by the education system in which I was teaching. I did not quite understand the circumstances in which I found myself. I had thirty-four students in each class composed of gifted students, on-level students, below-level students who were unclassified, students with disabilities of varying types and degrees, and English language learners who had multiple first languages and whose English abilities ranged from extreme beginner to advanced. I was trying to teach students who literally had no interest in learning and whose absenteeism was abysmal. Student behaviors portrayed a complete lack of respect for authority figures as well as peers, and undermined all efforts by the teacher to educate students who truly desired to learn. Parental involvement was almost nonexistent. I was supposed to prepare students for college and career readiness, but the majority of students had basic elementary level literacy skills. Additionally, hardly any students had been exposed to computers or any form of educational technology. Lastly, my administration and colleagues offered no support or guidance in how to teach this vastly diverse set of students. I came home everyday and cried due to the frustration and intense level of stress I was under. I looked back upon my own education and acknowledged that I had been sheltered in some way from the realities of the world. Perhaps while growing up there were students who I attended school with that were not interested in learning; that had high rates of absenteeism; that did not complete their homework; that did not study for exams; that had behavioral issues and interrupted the learning experience for their peers; and that had no parental support at home, but I was never exposed to these types of students. I was on the advanced track in school. I took honors classes as well Advanced Placement and college-credit courses. I virtually spent my entire education with the same forty students who were similar to me, and perhaps, were all from the middle class, where resources were in abundance and parental support was the norm. We were chastised for our bad behaviors and bad marks in school and were taught to perform well in order to secure a successful future for ourselves. None of what I had known and experienced throughout my own education was apparent in the system in which I currently taught. I was bewildered and confounded. Here I am, three years into teaching, and I contemplate leaving the profession. The American education system values conformity over individuality and self-expression. As Sir Ken Robinson stated in his talk Changing Education Paradigms, the American education system has become a factory system where we dole out students who are unable to think for themselves, but could state facts verbatim. Each student is expected to master the same reading, writing, and mathematical skills, but not to find passion in other subjects, which are now neglected in schools, such as the arts and trades. The curriculum encompasses a “one-size-fits-all” model, but each child is unique and should be taught to strengthen and foster their individual talents. Few of my students in Brooklyn fit this “one-size-fits-all” model that the American education system has created. Diane Ravitch further supports the holistic education of children in her book, The Death and Life of the Great American School System: How Testing and Choice are Undermining Education, where she stated, “We must make sure that our schools have a strong, coherent, explicit curriculum that is grounded in the liberal arts and sciences, with plenty of opportunity for children to engage in activities that make learning lively” (p. 13). The No Child Left Behind (2001) movement has taken the liveliness out of learning in favor of standardized testing that further alienates students who do not do well on these types of exams as well as teachers who are held fully accountable for students’ results. In my opinion, the Common Core Curriculum Standards do not accurately represent the student body of America today. The standardized tests and the new national curriculum merely reflect the goals and abilities of the elite, who have access to resources and parental support. These exams do not reflect the melting-pot culture of America, but merely the culture of our forefathers and colonial America. The American education system needs to reflect the changing times and experiences of current learners, like those who make up my inner-city public school in Brooklyn. How will America help all children excel in education, and not just the elite or native-born citizens? Reforms to education are needed, but not the type of reforms that critique and punish teachers who devote their lives to mentoring students and preparing them to become successful citizens. In its current state, the American education system is a downward spiral with no turnaround in sight, and it is our children who continually suffer the mistakes of bureaucrats who have never experienced the teaching side to education, yet tell educators how to teach.